The Food Safety Modernization Act, or FSMA, creates new regulations for every aspect of food production, from source to consumer. 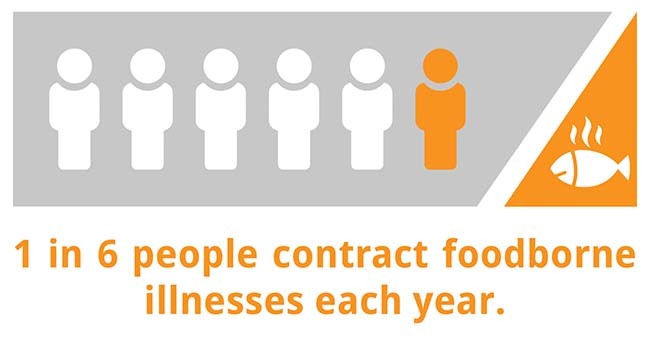 Currently, 1 in 6 Americans get sick from foodborne diseases each year.1 FSMA was created to address, reduce and prevent these cases of foodborne illness. FSMA regulations address every area of the supply chain, including storing and transporting food. When transporting perishable items, temperature control is key. Maintaining specific temperature ranges helps prevent microorganism growth and toxin formation, reducing foodborne illness and product loss.2 As a part of FSMA, temperature now needs to be officially addressed and processes recorded. Degradation in transit can contribute to microorganism growth later in the supply chain. Foodborne illness is a major concern, but degradation also contributes to product loss and profit loss for your company. Improving temperature control and sanitation assists in FSMA’s goal of reduced foodborne illnesses and boosts your bottom line by reducing product loss. Though FSMA puts the burden and liability on the shipper to dictate what the specific temperature and sanitary conditions should be, it is the carrier’s responsibility to maintain the proper conditions. This includes the carrier ensuring that trucks are pre-cooled, properly cleaned and comply with the shipper’s specifications. The shipper must then verify these things are done to comply with FSMA. Maintaining and recording temperature is easy for shipments that require a single temperature. Shipments containing multiple product types and requiring different temperatures need a more dynamic system. Even when utilizing bulkheads to create separate temperature zones, temperature violations can occur during transit. For example, a pallet too close to the bulkhead can be colder on one side than the other, and opening/closing the door during transport affects temperature control as well. When the shipper and carrier are the same company, these systems and processes for temperature control and carrier conditions are likely developed together. Though FSMA requires the shipper to create their specifications, they might not have enough information on how to fully maintain ideal conditions. Therefore, the best approach is for the originating shipper to work hand in hand with their carriers to develop specifications and Standard Operating Procedures (SOPs) to comply with all of the different variables, including trip length, varying temperature conditions and sanitation for trucks. Using RefrigiWear’s blankets, pallet covers and bags specially designed for temperature regulation helps protect product from unwanted temperature changes. This not only assists in reducing the chance of foodborne illness, it works to reduce product degradation and loss. An estimated 30-40% of food is lost due to degradation3 – that equals a significant amount of profit loss. RefrigiWear also offers handheld thermometers to help drivers check temperatures and make needed adjustments. FSMA’s regulations are very closely aligned with most carriers’ current operating procedures, so there likely aren’t many changes needed to be compliant. It is, however, an opportunity to locate areas that need improvement, create a new SOP for those improvements and move forward with a better chance of product protection and profitability. Click here to download a full PDF copy of the Transportation Product Guide.